Galicia and Volhynia have, over their history, long been subject to changes of power. In the twentieth century and with the outbreak of both World Wars, this fact could not revisit itself more often. The region, home to both Poles and Ukrainians, became locked in war between the two groups as they struggled for post-war sovereignty against a sprawling Germany and Soviet Union. While these two groups have not always been on amiable terms (primarily due to the centuries-long struggle for Ukrainian independence), World War II brought any and all tensions to the forefront, and it is under these multiple occupations that a devastating civil war and series of ethnic cleansings were made possible. Known as the Volhynian slaughter in Polish and Volhynian tragedy in Ukrainian, the Polish-Ukrainian conflict in Galicia-Volhynia was a tense and pitiless struggle between Poles of the Home Army (AK), partisans, and self-defense formations and the Organization of Ukrainian Nationalist’s (OUN) Ukrainian Insurgent Army (UPA). Some scholars ascribing to certain national narratives, however, fail to realize the scale and reciprocal nature of the conflict from beginning to end, even though both sides struggled for identical goals through identical means. This period was not limited to a single campaign of ethnic cleansing, but rather an ongoing chain reaction of cleansings that began and culminated under the auspices of multiple occupational regimes actively seeking to provoke and maintain this state of chaos. By looking at the events that took place as part of an extended continuum with multiple actors, and not as an isolated or one-sided event that spanned only a handful of years, we can better understand both the causation that led to and perpetuated this conflict, as well as the true gravity of events that unfolded for both sides. The first of these occupational waves took place in the aftermath of the First World War. The attempted creation of nation-states in Poland and Ukraine carried with them the same transitional issues similarly situated European states endured. In this transition away from an agrarian to a modern polity, cross-border friction over land ownership was only made worse by the authoritative policies of the Polish state at the time. With the newly reformed Polish state no longer imperial in design, ethnic cleavages were especially pronounced in the voivodships within Galicia and Volhynia where the Polish elite continued to rule as a minority of the population. On a local level, first hand reports cite the killing of Ukrainians along the San River. On an official level, Poles ruled heavy-handedly from 1920-39. In defiance of the League of Nations and its attempt to demarcate a border between two ethnic groups (known as the Curzon Line) Poland occupied and proceeded to divide Ukrainian lands with the Soviet Union. Ukrainians considered Polish occupation to be thrust upon them, whereas Poles considered western Ukrainian lands to be a necessary possession for state security. British commentary on government policy exclaimed that persecution provided Ukrainians with an “added consciousness and solidarity” and that Polish severity actually “increased the insecurity of the south-eastern frontier of the republic.” The Polish narrative tends to ignore the behavior and consequences of its interwar government. It should have come as no surprise, though, that the repressive policies of Jozef Pilsudski and the Polish colonization of Ukrainian territory fostered the growth of later Ukrainian insurgency. Regardless of which side shot the first bullet in the sequence of events culminating in the ethnic cleansing of 1943, neither side acted independently. Just as social tensions were brought to a boil by the multiple occupations the region endured, the German and Soviet authorities actively pursued a policy of provocation to pit the two sides, Polish and Ukrainian, against each other in order to divide and conquer. It is this factor which explains the issue of competing historical narratives of victimization from each side. Beginning in 1939, Soviet agents provoked conflict between Poles and Ukrainians in order to bring about “revolution” and justify the extension of the Ukrainian SSR into Polish territory beyond the San. In order to colonize the region and expand their Lebensraum (living space), Germans utilized preexisting tensions to let the colonized kill themselves off. In an example of “German meddling,” Germans offered Ukrainians a chance to persecute Poles in 1941-1942, and then, following Ukrainian desertions en masse to join the UPA, conscripted Poles to persecute Ukrainians the following two years. Another tactic used by Germans was to deploy, for example, forces against the Ukrainian population dressed as Polish soldiers, and vice versa. These provocative measures succeeded, so that each side remains steadfast in its conviction regarding victimhood and the actions of the historical “other.” These provocations proved to be extremely successful, but how did they result in such widespread violence between both societies? The simple answer is that the attrition of war wore down both sides to such an extent that ethnic cleansing could not be prevented. A complete breakdown of governance and justice essentially decapitated civil and local society, leaving both sides to rely on their respective underground military organizations as the only source of authority. The Ukrainian organization in particular by 1943 was left only with its youngest and most radical supporters. The Ukrainian Insurgent Army’s program of ethnic cleansing began in earnest in March 1943, but sporadic killings had already started through the fall of 1942; the earliest accounts being in the Sarny region of Volyn and continuing throughout the winter. Since Ukrainian police held a more significant role in Volhynia than Galicia, this made for an explosive situation when in March 1943, Ukrainians abandoned their roles in the German police, taking with them their weapons and firsthand experience in implementing German atrocities. The UPA’s forces in Volhynia would reach as many as 20,000 troops; however, approximately ninety percent of the UPA’s attacks would collectively take place in the Galician provinces of Stanislaviv, Drohobych, Ternopil, and Lviv. The majority of the UPA’s attacks in Volhynia aimed at cleansing the region occurred throughout March-April, July-August, then in tailed off by late December of that year. Many victims included innocent Polish civilians, but some analysis has shown that main targets still included AK and partisan formations, indicating that the UPA’s presence was not limited to punitive actions against ethnic Poles but also retained its military purpose in this war. The goal of the OUN was not to exterminate each and every Pole, but rather to swiftly and brutally enforce the resettlement of all Poles to the west of the Curzon Line, preventing any future possibility of claims toward the territory being “mixed.” In addition to Poles, factionalism within the OUN caused Ukrainian insurgents to kill tens of thousands of Ukrainians for siding with either the Melnyk or Borovets factions. Ukrainians who converted to Roman Catholicism were also killed. Historians in the Ukrainian diaspora focus on the Polish “retaliatory” actions that occurred during this conflict, and rightly so. 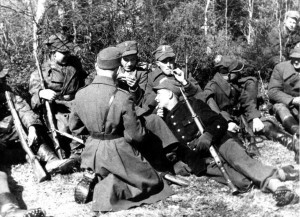 Much like the preemptive nature of the Ukrainian attacks in Volhynia, as early as 1941 Poles equated war with Germany to war with Ukrainians for Galicia-Volhynia, and sought to achieve a quick “armed occupation.” In order to carry out retaliatory actions against Ukrainian aggressors, Polish partisans created self-defense formations. Retaliation, however, was carried out inch for inch, and was ‘hardly less fierce’. Warnings to Ukrainians made in 1943 stated that every village burned would result in two Ukrainian villages being razed, and for every Pole killed, two Ukrainians would be killed in his place immediately. Orders issued in February of 1944 by Polish Home Army commander Lt. Kazimierz Babinski said only children would be spared; however, a month later a massacre by Polish partisans occurred in Kholm killing 1,500, of which 70% were women and children. The largest groups (namely the Wiklina, Kozaka, Korczaka detachments of the Polish Home Army) played a considerable role, cleansing the Ukrainian population from Kowal, Wlodzimierz, and Lubomel in 1943-44. By the middle of 1944 the feeling of many Poles was that they would still retake or even extend territory into Ukraine. That summer approximately 150 villages, home to 15,000 Ukrainians, had been razed in so-called retaliatory measures. Attacks aimed at eliminating civilian populations were not uncommon from the Polish side. Even prior to the “official” outbreak of ethnic cleansing by Ukrainians, massacres aimed at the Ukrainian population of Kholm had started as early as 1942. Often, even when no direct orders from the Polish government-in-exile were given, this had no bearing on impeding retaliatory measures, causing Ukrainians civilians in many cases to be killed indiscriminately and on sight. Retaliation also took place by proxy, whereby upon hearing new of killings in Volhynia, for instance, Poles in Galicia would take up arms against local Ukrainians.